This is a bodysuit for Nursoda's Brulba character. A template is included so you can make your own textures. 1) You're free to use these files in any render, non-commericial or commercial. 2) You may not sell the files themselves, either individually or as part of a compilation. 3) If you re-post these files on your website or as part of a free compilation, the archive must include this readme file. After you've installed the files, open Poser. Load Brulba and the bodysuit, conform the suit to brulba, and away you go. Just downloaded what I posted, installed it in a separate runtime and tested it. Yes, the She-Brulba morph is included, and yes, it does work. Ummm... I did. Why, are they not working? Nitab (6 years ago) Inappropriate? Jim, this is wonderful. Thank you. 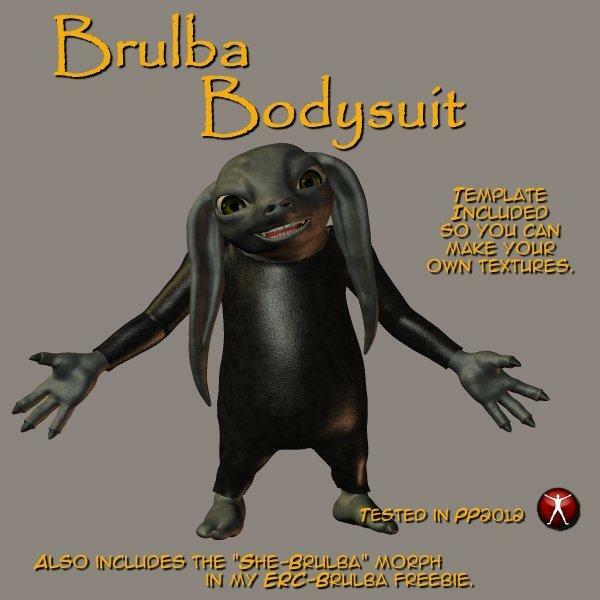 But if it isn't asking too much, could you possibly add the She-Brulba morphs to the bodysuit? I would love to make her some clothes using the bodysuit. Thank you. Wayii (6 years ago) Inappropriate? pokeydots (6 years ago) Inappropriate? Whoops - minor error in the CR2. If you downloaded before, please download again. Thanks!